[float=left] [/float] Officials of the Lagos State Taskforce on Environmental and Special Offences (Enforcement) Unit have arrested a man for selling phones stuffed with ‘fufu’ to unsuspecting buyers at the Computer Village, Ikeja, Lagos. After his arrest, it was discovered that instead of the original battery in the phone, the phone is stuffed with fufu to make it heavy and look like the normal phone. It is then sold to unsuspecting members of the public. The suspect, 24 years old Samson Adebiyi from Ogun State, was arrested on Wednesday at the Computer Village after the man, Semiu Ambali, who first fell victim to his antics, set him up. According to Adebiyi, those selling fufu phones to unsuspecting buyers are many at the Computer Village. The syndicates usually have several phones on them and do not have shops at the Computer Village. They approach a customer and display their phones and once that customer is interested, they bring out the particular phone the person wants to buy, remove the battery, test it so that the customer can be sure it is okay. In the process of the customer being distracted, the seller quickly replaces it with another phone (but of the same brand). 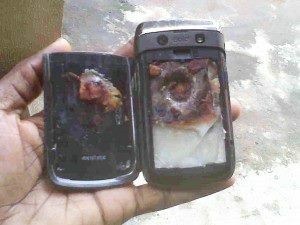 The only difference is that the battery of the fake phone is replaced with fufu. Once the unsuspecting buyer accepts the phone and pays, the sellers relocate to another part of the Computer Village where no one could see them and play the same tricks on others. On this occasion, Ambali was shown the phone he wanted to buy by Adebiyi, who agreed to sell the phone at N8,000. According to him, the phone was tested and certified okay and that at the moment he was distracted, the phone was replaced with a fufu phone and that he only realised this when he got home. The following day, he spent almost the whole day looking for the suspected swindler and as luck would have it, he caught up with him and alerted the police. Instead of grabbing him, he decided to play the same game all over again with him. He agreed to pay N4,000 for another phone that had been tested and certified okay by Adebiyi. He pretended to be distracted, only for the fake phone syndicate to exchange it with another fufu phone. It was then the taskforce officials who were lurking around, grabbed Adebiyi and took him to their office and detained him. The suspect confessed to the act, saying that he did it to make ends meet. He said several of his colleagues were still at the Computer Village engaging in the same act. Adebiyi said he used to be a cobbler and that since the business was not lucrative, he decided to engage in selling fake phones with fufu battery. Taskforce Chairman, Bayo Sulaiman said the taskforce had received several complaints about the activities of syndicates selling fufu phones, saying this was why it raided the Computer Village recently to stop street trading. He said the suspect would be charged to court and punished if found guilty. Thank God for the successful arrest of the man cos they are so many of the there. But this would surely serve as a lesson to anyone who is still involved in this dubious biznez.